PT Rajawali Nusindo - Nusindo or referred to as "Rajawali Nusindo" is a rapid growing trading company in Indonesia with core business in the field of trading and distibuting of pharmaceutical and medical equipment, agricultural products, and also general products. PT Rajawali Nusindo is a a trading and distributing subsidiary company of PT Rajawali Nusantara Indonesia (Persero) or RNI Group, a leading diversified holding company in Indonesia which is fully owned by the Government of Indonesia. At present, 100% of its shares are held by RNI Group. Headquartered in Jakarta, Rajawali Nusindo runs its business through 7 main branch offices, 8 associate branch offices, 15 prime branch offices, and 13 pioneer branch officees spread all over Indonesia. . In term of financial performance, Rajawali Nusindo has shown solid performance in 2014. According to Rajawali Nusindo's Annual Report 2014 as cited by JobsCDC.com, Rajawali Nusindo registered a 4.36% growth in total net income of Rp 2,619.70 billion as compared with Rp 2,510.05 billion in 2013. Rajawali Nusindo’s current year profit in 2014 amounted to Rp 1.27 billion as compared to Rp 12.11 billion in 2013. Male/Female, Single, age of candidate under 27 years old. Have own motorcycle and driving license class C and A (SIM C/A). Have the ability to operate Office application. The candidate with prior experience in the same position is preferred. Male, Single, age of candidate under 27 years old. JobsCDC.com now available on android device. Download now on Google Play here. Please be aware of recruitment fraud. The entire stage of this selection process is free of charge. 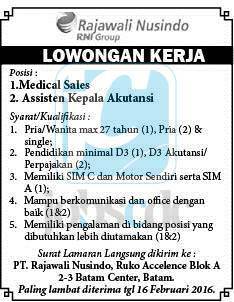 PT Rajawali Nusindo - D3 Medical Sales, Assistent Accounting Head RNI Group February 2016 will never ask for fees or upfront payments for any purposes during the recruitment process such as transportation and accommodation.